I hope nobody has arachnophobia because after yesterday’s entry we are forced to deal with yet another Spider, albeit one of a slightly different nature. Joe Morris’s transition from highly regarded jazz musician in Lionel Hampton’s band to the leader of his own group that waded into rock ‘n’ roll at its very outset seemed like a rather smooth road for him to take. Atypically smooth in fact. The reason for this is because there appeared to be no confusion over their intent. No hand-wringing over the wisdom (or lack of wisdom as the case may be) of their ultimate decision to forsake the respected world of jazz for the low-brow – and still commercially uncertain – world of rock. In their first two releases, the seductively mellow Lowe Groovin’ for Atlantic and the scintillating Boogie Woogie Joe for Manor Records, they didn’t seem at all conflicted over their direction. The style in which they played, while certainly executed with jazz-like proficiency, was perfectly in line with the rock idiom they now were immersed in. The structure of the songs, the nature of the arrangements, even the tone of the instruments for the most part, were all squarely rooted in rock’s burgeoning parameters, not jazz. Furthermore by peaking ahead we know that Morris will remain a rock artist for the rest of his career and a highly successful one at that, not just under his own name but also recruiting singers whom he’d back on stage and on record, a few of whom scored massive hits including some all-time rock classics. So unlike some other jazz transplants, even his fellow Atlantic Records stable mate Tiny Grimes who constantly (sometimes maddeningly) veered between genres, Morris’s career trajectory looked all but set from the very moment he went out on his own. Of course with a lead-in like that you know you’re about see a curveball thrown your way and this is it. The primary figures in this particular tale can be narrowed down to about four individuals. The first two are of course Joe Morris himself and his main musical cohort, saxophonist Johnny Griffin who initially convinced Morris to leave their steady secure jobs with Hampton behind so they could go off and seek their own fame and fortune. Both men were highly skilled horn players with deep jazz roots who were now treading in uncharted territory as rockers. But was that intentional, as we like to think, or merely circumstantial? The other figures involved would be Atlantic Records heads Ahmet Ertegun, a novice in the field at this point, but someone with a deep love of jazz, and his partner, the far more experienced Herb Abramson whose own affinity for jazz was unquestioned but who’d already made serious headway with the first ever rock vocal group The Ravens while at National. Since Atlantic was just getting underway in the final months of 1947 their musical direction was still up in the air and as such they cut anything and everything they could, just to be able to get enough sides in the can to issue once the recording ban hit, only to soon realize that most of it was unreleasable garbage. The two artists who were the exceptions to that low-quality trend were both jazz refugees, Grimes and Morris. So the question you have to ask is what were they all thinking when they entered the recording studio that December? Were they casting their fate wholeheartedly with rock music, a style with barely any track record to go on in the three months since its arrival, one without an actual hit record as of yet to point to its commercial viability… one without so much as a documented name or confirmed audience to prove it even existed?!? Though they may have sensed the movement in the air, understood the need for something more vibrant and low-down that could stir the emotions of younger and possibly less cultured listeners, they could scarcely afford to bank on it, especially as once 1948 rang in they’d have no chance to correct any missteps with their output. As for Morris and Griffin, I think their decisions were more instinctual by nature, wanting to play something that excited them and feeling they could pull anything off well if their hearts were in it, but even in their case the lack of any prior experience in moving this far away from the rather structured and sensible confines of jazz meant that they’d surely be apt to stick reasonably close to the familiar for the most part. So just how DID they all make the leap to rock? It would appear that it was a combination of things, most notably the musical restlessness of Morris, Hodges and crew. Perhaps feeling confined by the limits placed on them within Hampton’s well-oiled machine they merely stretched out and colored outside the lines so to speak, just because they COULD now. In ordinary circumstances maybe it’d be a momentary diversion before settling back into what was expected of them. But these weren’t ordinary circumstances. The musician’s strike meant that whatever they laid down in their late 1947 sessions would be the material getting released and depending on its reception their fortunes might never recover should it fail to connect. On the other hand, when it DID manage to make an impact commercially the dye would be cast in another direction. If it was the rockin’ sides that had sold, not only for them but as we’re seeing more and more as the months roll by for others as well, then surely they’d be called on to deliver more of the same. So maybe in the end you can chalk Joe Morris’s career legacy up to serendipity. How can we be sure? Well, we can’t really, but we can make some educated guesses, starting with the fact that Morris had two sessions with Atlantic in December, cutting a total of eight sides, six of which were released. Four of those songs were clearly, unmistakably, positively in the JAZZ idiom. The two that weren’t of course were Lowe Groovin’ (which while not an official hit on the rather limited ten spot Billboard listings, was Atlantic Records best seller to date) and this one… The Spider. Suddenly Morris’s jazz career was about to take a back seat to something very different. Of all the records we’ve encountered so far, including even some of the earliest sides by artists who clearly weren’t going to be sticking around very long, this record is a case of Jekyll & Hyde. Six of one, half dozen of another. Jazz and rock. At the risk of making light of a serious medical condition for the sake of a mere music review, call an entomologist because The Spider suffers from schizophrenia. Atlantic may have been an inexperienced label but they could see the writing on the wall when it hadn’t been Morris’s jazz side (Jump With Me) that had stirred the action that first time out, but rather the simpler and more direct rockin’ side, Lowe Groovin’. Whatever high-minded artistic aspirations they all had, musicians and record company alike, bills were piling up and needed to be paid. The only record that had brought in any money to date was the rocker. Furthermore other artists on other labels were scoring with this newfangled mongrel musical child themselves and so Ertegun and Abramson did the only sensible thing and combed through their remaining sides from Morris and chose the one with the closest DNA to what had gotten them their biggest return of any record thus far. That it’s not QUITE rock from start to finish matters little, because what IS rock more than suffices. The stop-time intro epitomizes this dual nature with Morris’s trumpet playing the melody which is leaning towards jazz while Johnny Griffin’s lewd sax retorts drag you into the rock gutter. By the second time through however Morris has seemingly been corrupted and his tone thickens, sounding more forceful and your hope starts to rise. But when Griffin gets his first solo he dampens the mood temporarily, playing a melodic winding refrain that while not exactly arty in any sense, is a bit too whimsical for rock’s aesthetics. The gap between the two approaches starts to become apparent. Yet each time he seems to be about to wander off into the abyss he injects a grittier passage that keeps him grounded. As we pass the halfway point you may be about to give up on them finding their way back to our sensibilities as rock fans. It’s certainly more relatable to our mindset than a lot of jazzier sounds, but it’s hardly indicating that Morris and crew will be more than temporary interlopers in the rock jungle after all. Oh well, you say to yourself, at least they gave us two fairly notable tracks we can be thankful for. But then, just as you’re resigned to looking ahead to see who’s next on the rock ‘n’ roll playlist for this month, they suddenly seem to sense your waning interest and make an all-out desperate attempt to win you back over and I’ll be damned if they don’t succeed at it and then some! A few longer held notes by Griffin at the 1:25 mark leads into his most inspired run (or if you were one of those jazziacs hoping they’d leave this trashy noise behind and come back to your neck of the woods, then you’d surely classify this section as their most coarse, unsophisticated and garish playing). Either way it’s the same thing, just viewed with far different perspectives. From OUR perspective this is most assuredly what we came for – raunchy sounding riffs, paint peeling highs interspersed with a few flatulent lows, capped by a back and forth exchange by Morris and Griffin that is positively gripping. That it then goes on from there, repeating the same formula with even more emphasis on the obscene limits of the horns, leaves us ecstatic and cursing the fact they all but wasted a minute and a half showing they were good musicians when in fact what we wanted was dirty music that most people in cultured society would call anything but good. That last minute or so elevates this to the level of some of the best rock instrumentals we’ve heard so far. Its schizophrenic nature drags it down overall, yes, but what it really shows is the split in their musical aspirations to begin with. On one hand they had to know this type of thing was looked down upon in terms of critical assessment that mattered to most jazz-reared professionals. But on the other hand they surely knew it would get a rise out of the paying customers, the ones who sustain your career by coming to your shows and buying your records. At this point in time, newly formed and trying to make names for themselves independent of those they’d cut their teeth with, I’m sure the stylistic diversity seemed like a smart move, not a conflict at all. The classier sides would serve as their artistic statement and shape their overall image while these cruder songs would merely act as show stopping interludes to give them some word of mouth buzz when they came into each town. Imagine their surprise when it was the less technically proficient, coarser sides that record buyers preferred. Sometimes in life you make your own decisions, other times your decisions are made for you. While they certainly were complicit in determining their ultimate fate, as their enjoyment in playing this style is evident from the very start, it probably wasn’t intended to be more than a diversion to the more refined approach that would be their bread and butter. But to their credit, Atlantic and Morris both, when they got an unexpected reaction to their rock experiments they didn’t look back. Guess it was fate after all. 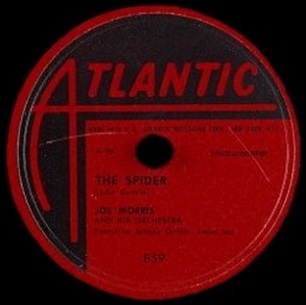 Leave a reply on "Joe Morris: “The Spider”"